Roblon comprises four product groups: fibre cable, offshore, TWM (machinery for twisting, winding, and rope manufacturing) and lighting. Roblon is the world’s leading supplier of both fibre-based products and machinery for the fibre cable industry. Roblon both specializes in the development of high-tech fibre products and advanced machinery for the fibre cable industry. The industrial cable fibres from Roblon are acknowledged for the development-oriented approach and are frequently called upon, when novel solutions are needed. The extensive experience combined with their understanding of the customer’s needs enable them to offer the most future-oriented and efficient cable-making solutions in the market. 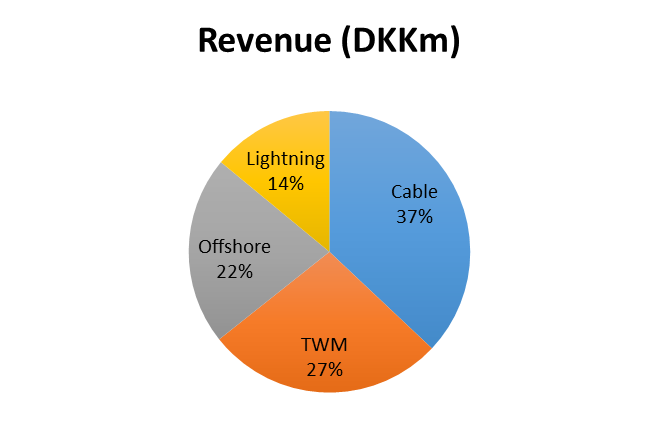 Demand for fibre optic cables is driven by an ever-increasing demand for lightning-fast data transfer for faster Internet connections, server solutions “in the cloud”, video-on-demand services and online gaming. As an experienced supplier to the offshore oil and gas industry, Roblon specializes in the development of high-tech fibre products. The offshore oil and gas industry is supplied with fibre-based products for strapping and piggybacking as well as products for reinforcement of flexible risers and composite pipes. Roblon Offshore & Composite Systems also produces special industrial fibre products, which require a high level of product development and innovation. In this field most products are customer specific and often developed in close cooperation with the customer. The market is growing and new uses for Roblon’s strong and lightweight fibre solutions are constantly being found. For the same reason, innovation and product development often take place in close cooperation with our customers. They turn to us with the expectation that Roblon’s know-how on synthetic fibres in off- shore environments can help to address a specific challenge. Since 1978 Roblon Industry has developed an extensive product programme consisting of equipment and accessories for the production of twine, rope, and cordage. The market for twisters, rope-making machinery and winders is highly globalized with a stable market trend. As a general rule, the demand for Roblon’s equipment follows the economic business cycles quite closely. Products for fibre-optic lightning and LED lightning. Many different grades of LED light fittings and solutions are now offered at various price levels, with the market dominated by a large number of low-price manufacturers. Roblon focuses on quality lighting and on customers with a strong business incentive to invest in good lighting. These are customers for whom perfect lighting is essential for presenting their products as attractively as possible. An important factor that affects the prospects for 2015 is the rapidly falling oil price. Prices have fallen by more than 40% since the summer 2014. The falling prices will result in and does already result in a drop of new investments within the oil industry. Many oil companies that operate in the North Sea follow the rule of thumb that new investments are deferred when oil prices hit USD 80 per b arrel. The direct revenue from the oil industry accounts for 20% of Roblon’s total revenue. One of the ways Roblon will continue business and market development is by having more of a presence in relation to both existing and prospective customers. In the current financial year this will take the form of investing in additional sales staff. In the short term this will lead to greater costs and some impact on the operating profit. We perform a Discounted Cash Flow Analysis based on unlevered free cash flow. We base our estimates on the periods from 2009 to 2014, which are the most recent annual reports. Over this historic period Roblon have nearly had a 40% growth in revenue, as well as improving margins. What might be of concern is that in recent periods, revenue has not been improving and margins have remained good, but not improving. This will affect our estimate of future growth to be positive, and with slightly increasing margins. We base the WACC on the offshore/manufacturing industry average. A WACC of 9% might seem high, but we believe that there is some unresolved uncertainty with Roblon’s offshore sector, which is a sector undergoing a downwards trend. We see that the stock price is highly affected by changes in the WACC (as usual). In many of the scenarios we find the target price below the stock’s current price. This seemingly low to no upside leads to a hold recommendation. As Roblon is operating in a highly specialised industry, we have chosen to compare peers on a matching industry level and neglecting the geographical dimension. This entails that the selected peers evaluation result should be acted upon with caution. According to peers it seems that Roblon’s equity includes a pricing advantage on earnings and book value of equity compared to peers with P/B = 1,91 and P/E = 11,97. 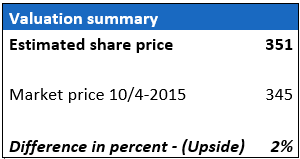 There seems to be no pricing advantage on the sales amount for Roblon’s equity. Also Roblon’s ROE figure is 25% lower than average (15,55%) where the ROE peer average is mainly driven by the AF Gruppen average of 20,75%. The ROA level for Roblon is 59% above average. When assessing D/E, Roblon is 37% above average of peers, which might indicate higher long term risks than that of the peers. The current ratio indicates a lower short term risk than Peers, which should make Roblon better able to meet its short term obligations. The Quarterly statements show no significant recent upwards adjustments of earnings expectations. The overview shows that Roblon is quite good at meeting their expectations on earnings, which is very positive. Therefore it is not expected that the company will make any shock downgrades of expected earnings. Overall, we issue a hold recommendation on Roblon A/S. This is based on an estimated share price of 351, which reflect an upside of 2% and taking the P/E ratio into account we can see that Roblon is traded at a lower price than its competitors. 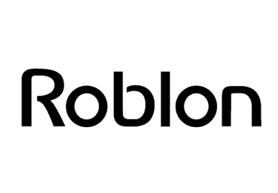 Furthermore Roblon have been quite precise in their resent annual earnings expectations indicating that it is a trustworthy and stabile company.